Hosted by H.G. Bishop David at the Archdiocese in Cedar Grove, NJ, Ctech held its first meeting. It was very successful! Topics discussed were: Google Checkout for Non-Profits, Free Web Hosting for churches, Fellowship One & ACS (Church Database Systems), Live Streaming Options, Website Development (Joomla or Drupal), and a SMS Massaging List. A Google Group will be created to further communicate. Further meetings were requested to be held quarterly. Ctech stands for Coptic Technology. Ctech refers to all the technology that can be implemented in both our churches and their ministry. The Mission Statement of Ctech is the sharing of knowledge and experience between all of our churches. It is a forum for the communication and dissemination of information pertaining to technology, its use, and application in church ministry. To that end, with the blessings of H.G. Bishop David, Ctech will host events in which church representatives can present information or ideas to the Coptic Tech Community. The objective of Ctech is the sharing of technological knowledge and experience between all of our churches. It is a forum for the communication and dissemination of information pertaining to technology, its use, and application in church ministry. To connect our Churches through technology. To network the Tech Specialists of our Churches. To provide a forum and communication method for collaboration on projects and joint tech initiatives. Use your 501(c)(3) tax-exempt organization’s address. Make sure your EIN matches your non-profit organization’s Tax ID number. 3. After you sign up, select Non-Profit (IRS certified 501c3) as your Primary Product Type on the ‘Settings’ page, then click Save profile. VERY IMPORTANT – Scanned copy of most recently filed IRS Form 990 (you probably don’t have this because as a church we are exempt from filing this form) or a copy of a Letter of Determination from the IRS. If we don’t have one of these to verify our tax-exempt status they will deduct 2% from every transaction. If you can’t get one of these, you can fill out the form 990 (The Church Treasurer should be able to do this. The form is readily available online.) or (Church Board Member or authorized party) call IRS number for non-profits (1-877-829-5500) and ask them to mail you “a letter of affirmation” (of the letter of determination) (Takes 10-14 Business Days). Hours of Operation: Monday – Friday, 7:30 a.m. to 5:30 p.m. Central Time. Coptic Presentations is a software package which bundles together all the text of the services of the Coptic Orthodox Church. It was initiated and founded in 2000 by a small group of dedicated youth from St. George & St. Shenouda Coptic Orthodox Church in Jersey City, NJ under the direction of Hegomen Fr. David Bebawy. 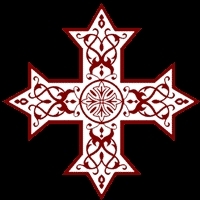 They are dedicated to providing the PowerPoint presentations for all our Coptic Orthodox Church services on the computer for free. With many years of hard work and dedication we happily invite all to use this software for the glory of God. Required fonts to view: Athanasius & CS New Athanasius. Funeral Services for Priests, Deacons, Men, Women, Boys, & Girls.